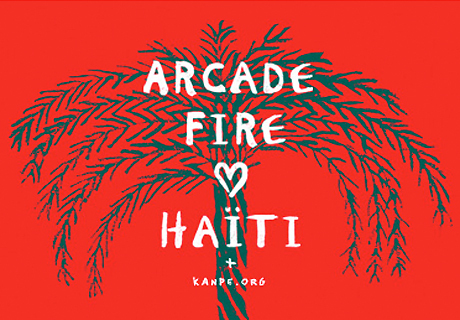 The holiday season has a way of bringing out people's charitable nature, and Arcade Fire are hoping you will send some season's greetings via a donation to Kanpe, an organization that continues to help rebuild Haiti following a devastating earthquake almost two years ago. As an added bonus, the band have promised to, once again, match donations. A post on the group's website from bandleader Win Butler explains that the gang are hoping to match your donations to the cause dollar for dollar, though they have capped their matching abilities at $300,000. Arcade Fire will then celebrate your generous spirit by writing a personalized Christmas card. You can read the full statement below and then head over to the Kanpe site and make a pledge here. This is Win from Arcade Fire. If you are having a hard time deciding what to get your friends and family for gifts this year, give them our money! For any donation you make to Kanpe this holiday season, the band will match it. We will also send a nifty little post card, signed by Regine and I, to put under the tree, or wherever you put your gifts (it's not our business). For any silicone valley jerks who might try to bankrupt us, let's put the upper limit at 300,000$… Have a great holiday!